Katie Lowry gives her favorite pig, Sloppy Joe, a hug. Courtesy photo. Katie Lowry, member of the Burlingame 4-H Club, has been in 4-H for three years. Projects taken to the fair include horses, for which she won three purples and four blues, reserve high point junior division, and grand champion gelding at Osage County Fair. She took home six blues and one red, reserve high point junior division and grand champion gelding at Overbrook Osage County Fair. In swine, she won two reds and a blue at Osage County Fair; and two blues and reserve champion AOB at the Overbrook fair. In bucket calf class, she won reserve grand champion at Osage City, and a blue ribbon at Overbrook. Her favorite 4-H activity of the last year was showing at the fairs and seeing friends from camp. “I also really liked participating in the demonstration contest at the state fair this year!” Katie said. 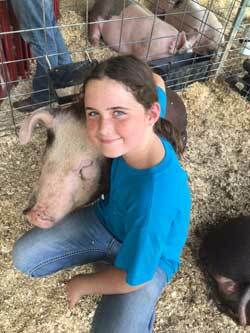 Her best 4-H memory or experience this year was: “Going to camp for the first time, making new friends, and raising my market pig, Sloppy Joe,” she said.